We stopped carrying the Pen Portfolios because we wanted to find something that was higher quality and with a better lining. Well here they are and we are thrilled with them! The Portfolio is made from nice soft black padded Leatherette with a smooth lining which will not scratch or discolor your pens, sturdy nylon zipper and Leatherette flap that folds over to keep pens on each side from rubbing together. We are confident that you'll love them and we've priced them so you can afford to have several. 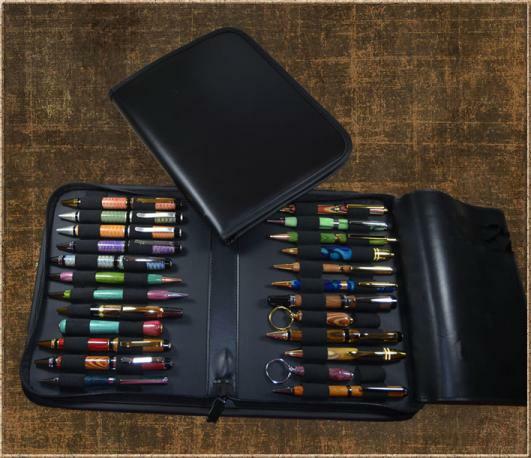 **FYI** You'll see in the photo we put several Cigar pens in the case to show that you can have very large pens and the case will still close and not look overfull or tight. There will be a shipping surcharge added to cover a larger shipping package. If you order one case and a few small items it will fit in a Flat Rate Priority envelope. If you order several items, we may need to ship by weight or in a Medium Flat Rate Box. If your order calculated to a box and we can ship it for less, as always, we will refund the shipping without you even having to ask! Each Case holds 24 finished pen/pencils..etc. This case is great for craft shows with limited space. The case is so nice you can just un-zip and leave your pens in the case for display. Helps you keep a better eye on the them too. When the show is done, just zip up your case and you are ready to go.